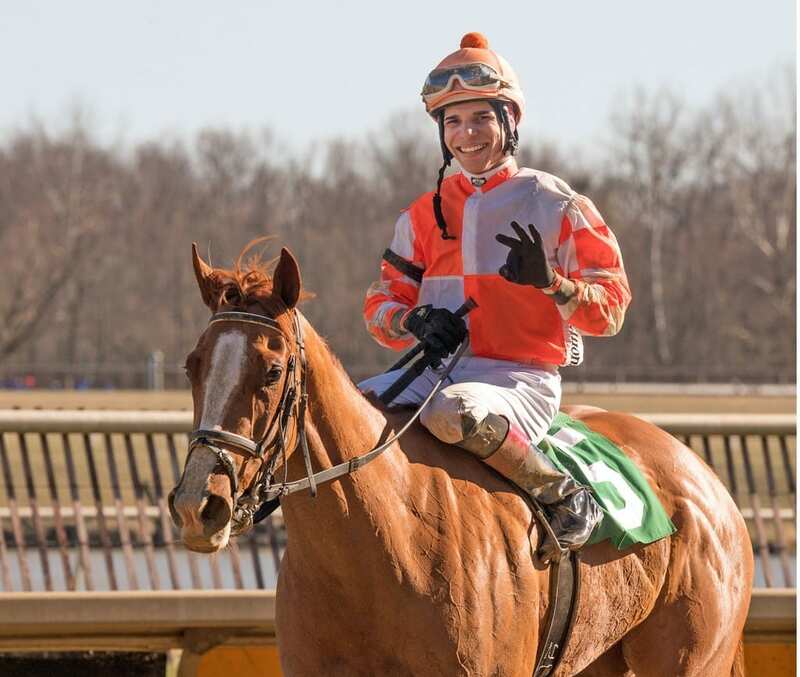 Jorge Vargas, Jr. has remained consistent in our alternative jockey rankings, leading once again with more points than any other rider at Laurel Park. With a score of 330.44, he has a comfortable 20-point lead over his nearest competitor. With four visits to the winner’s circle since our latest ranking, Julien Pimentel slides into second with 310.95 points. Previously third in our point standings, Pimentel is now followed by Jomar Torres (269.53), Weston Hamilton (269.13), and Feargal Lynch (261.96). Lynch had held second two weeks back but has been winless in 15 local tries since. Hamilton is new to the top five, his ranking built on his strong win total (41, second overall) and improving win percentage (15.59 percent, seventh overall). Our ranking system incorporates wins, win percentage, earnings per start, and wagering return on investment. The leading rider in each category receives a score of 100 per category, with other jockeys obtaining a percentage of that. That means that a leader in all four categories would receive a score of 400 total. This rating system is designed to highlight individuals who win frequently, and score in major races. Our stats have been applied to each jockey at Laurel Park who has made at least 30 starts and won at least once. Vargas remains on top in the win colony, climbing from 38 victories to 44 since our last check-in. Weston Hamilton has also remained consistent by holding his place in second with 41 wins. With an impressive nine wins added to his name over the last couple of weeks, Hamilton remains well clear of Sheldon Russell, who is ranked third with 27 wins. Torres and Pimentel finish out the top five, with a victory count of 26 and 24 wins, respectively. The theme of consistency continues into our win percentage category, as Pimentel continues to show the way just like he did a couple of weeks ago. Pimentel has ridden to victory four times since our previous ranking, bringing his leading percentage up to 21.82 percent from 20.20 percent. Vargas has made his way into second, with a strike rate of 19.21 percent. Edwin Gonzalez now sits in third with a win rate of 18.18 percent, followed by Torres at 17.11 percent, and Lynch, who has a success rate of 17.00 percent. In our last check-in, Elvis Trujillo resided in second when it came to earnings per start. Since then, Trujillo has managed to make his way into the top position. His earnings per start of $7,148 have him just ahead of Lynch, the new runner-up at $7,024. Pimentel comes in at number three, with earnings of $6,840 per start. Vargas and Steve Hamilton complete the top five, with earnings per start of $6,756 and $5,662, respectively. Carlos Quinones continues to be kind to his supporters, returning an average of $2.80 for each $2 win wager placed on his horses. That is more than any other jockey. He leads with an advantage of .80 cents, keeping him safely ahead of Kevin Gomez, who comes in second with an ROI of $2.00, and they are the only two riders in the colony not costing bettors money. The rest of the top five in the category are J.D. Acosta ($1.96), Luis Rodriguez ($1.92), and Torres, who returns his bettors with $1.72 for each win wager. Vargas’ overall advantage is built on his consistency. He is in the top four in three categories, including wins, in which he is first, and win percentage, where he’s second. The rankings include all races run at Laurel Park through April 26, 2018. Bravo. This in the sort of thing I will pass along. As senior turf writer I know for certain the racing fan has a hunger for on the scene reports of any kind. Human interest stories are atop the list IMO, but as long as you give the fan something to much on they will come back for more. When I went to enter my name, e-mail, website it was all in caps. Most likely my e-mial address will not work because it’s all in lower case letters.